Riverbed Granite enables a new edge virtual server infrastructure (Edge-VSI) architectural approach that does for edge servers what virtual desktop infrastructure (VDI) did for desktops - it allows IT to consolidate and manage branch resources in the data center. With Granite, global enterprises can finally achieve complete consolidation of edge applications, servers and storage to the data center. 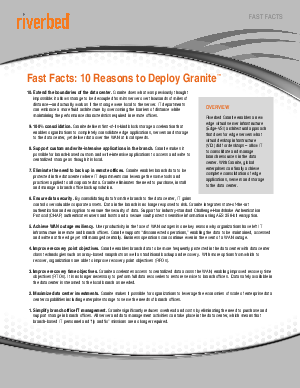 Download now to learn more about the benefits of Granite including improved recovery time objectives, ensured data security, and support for custom and write-intensive applications in the branch.